Humira is used to reduce the signs and symptoms of moderately to severely active rheumatoid arthritis (RA), polyarticular juvenile idiopathic arthritis, psoriatic arthritis, ankylosing spondylitis, plaque psoriasis, and and a chronic skin condition called hidradenitis suppurativa. It is also used reduce the signs and symptoms of moderately to severely active Crohn’s disease or moderately to severely active ulcerative colitis, after other drugs have been tried without successful treatment of symptoms. Humira is also used to treat non-infectious intermediate, posterior and panuveitis in adult patients. HUMIRA (adalimumab) is a recombinant human IgG1 monoclonal antibody specific for human tumor necrosis factor (TNF). HUMIRA was created using phage display technology resulting in an antibody with human derived heavy and light chain variable regions and human IgG1:k constant regions. Adalimumab is produced by recombinant DNA technology in a mammalian cell expression system and is purified by a process that includes specific viral inactivation and removal steps. It consists of 1330 amino acids and has a molecular weight of approximately 148 kilodaltons. HUMIRA is supplied as a sterile, preservative-free solution of adalimumab for subcutaneous administration. The drug product is supplied as either a single-use, prefilled pen (HUMIRA Pen), as a single-use, 1 mL prefilled glass syringe, or as a single-use institutional use vial. Enclosed within the pen is a single-use, 1 mL prefilled glass syringe. The solution of HUMIRA is clear and colorless, with a pH of about 5.2. Each 80 mg/0.8 mL prefilled syringe delivers 0.8 mL (80 mg) of drug product. Each 0.8 mL of HUMIRA contains adalimumab 80 mg, mannitol 33.6 mg, polysorbate 80 0.8 mg, and Water for Injection, USP. Each 40 mg/0.4 mL prefilled syringe or prefilled pen delivers 0.4 mL (40 mg) of drug product. Each 0.4 mL of HUMIRA contains adalimumab 40 mg, mannitol 16.8 mg, polysorbate 80 0.4 mg, and Water for Injection, USP. Each 40 mg/0.8 mL prefilled syringe, prefilled pen, or single-use institutional use vial delivers 0.8 mL (40 mg) of drug product. Each 0.8 mL of HUMIRA contains adalimumab 40 mg, citric acid monohydrate 1.04 mg, dibasic sodium phosphate dihydrate 1.22 mg, mannitol 9.6 mg, monobasic sodium phosphate dihydrate 0.69 mg, polysorbate 80 0.8 mg, sodium chloride 4.93 mg, sodium citrate 0.24 mg and Water for Injection, USP. Sodium hydroxide is added as necessary to adjust pH. Each 20 mg/0.4 mL prefilled syringe delivers 0.4 mL (20 mg) of drug product. Each 0.4 mL of HUMIRA contains adalimumab 20 mg, citric acid monohydrate 0.52 mg, dibasic sodium phosphate dihydrate 0.61 mg, mannitol 4.8 mg, monobasic sodium phosphate dihydrate 0.34 mg, polysorbate 80 0.4 mg, sodium chloride 2.47 mg, sodium citrate 0.12 mg and Water for Injection, USP. Sodium hydroxide is added as necessary to adjust pH. Each 10 mg/0.2 mL prefilled syringe delivers 0.2 mL (10 mg) of drug product. Each 0.2 mL of HUMIRA contains adalimumab 10 mg, citric acid monohydrate 0.26 mg, dibasic sodium phosphate dihydrate 0.31 mg, mannitol 2.4 mg, monobasic sodium phosphate dihydrate 0.17 mg, polysorbate 80 0.2 mg, sodium chloride 1.23 mg, sodium citrate 0.06 mg and Water for Injection, USP. Sodium hydroxide is added as necessary to adjust pH. Some people using Humira have developed a rare fast-growing type of lymphoma (cancer). This condition affects the liver, spleen, and bone marrow, and it can be fatal. Humira can also lower blood cells that help your body fight infections and help your blood to clot. Serious and sometimes fatal infections may occur during treatment with Humira. Humira can bring relief from symptoms of autoimmune diseases such as rheumatoid arthritis. An autoimmune disease is one in which the body’s immune system falsely detects and attacks a threat within the body that does not really exist. This can lead to a number of problems and conditions, including rheumatoid arthritis, psoriatic arthritis, ankylosing spondylitis, Crohn’s disease, and psoriasis. TNFα triggers inflammation when the body is under threat, and the immune system goes into action to protect it. However, too much TNFα can attack healthy tissue and cause inflammation. Humira binds to TNFα and blocks its inflammatory effect. This reduces pain and inflammation in patients with autoimmune diseases. Humira is a long-term treatment. Patients respond at different speeds to its analgesic and anti-inflammatory effects. According to the manufacturers, Abbvie, some people see benefits after 2 weeks, while others may need to take it for 3 months or longer to seen an improvement. It is vital for the patient to adhere to the treatment plan for best results. Those who stop taking their medications are most likely to have overactive immune systems again. Humira is injected into either the abdomen or the thighs, using a prefilled pen or syringe. The injection should not be given in skin that is bruised or tender, or where there are patches of psoriasis. Patients normally administer Humira themselves. A single-use pen contains 40 milligrams of medication, while a syringe may contain 40, 20, or 10 milligrams. 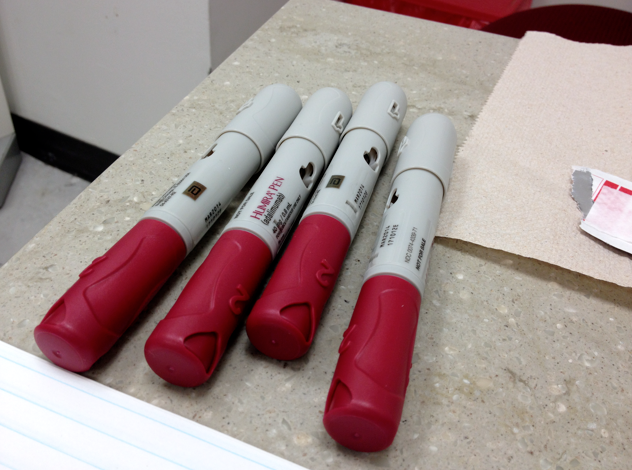 Humira use begins with a starting dose, followed by regular doses, normally every second week. A doctor will advise the patient about their dosage requirements. There are specific instructions for storage and use, and patients are advised not to use the Humira pen or syringe without first being shown by a doctor and without reading the full instructions. Patients are advised to practice first with a health care professional, to ensure they are not startled by the click when administering the dose. Use Humira exactly as prescribed by your doctor. Follow the directions on your prescription label. Do not use this medicine in larger or smaller amounts or for longer than recommended. Use Humira regularly to get the most benefit. Get your prescription refilled before you run out of medicine completely. The dose schedule for Humira is highly variable and depends on the condition you are treating. You may need an injection only every other week. Or you may need up to 4 injections in 1 day for 2 days in a row. Follow your doctor’s dosing instructions very carefully. Do not start using Humira if you have any signs of an infection (fever, chills, night sweats, weight loss, body aches, tiredness, cough with mucus, feeling short of breath, skin sores, stomach pain, diarrhea, pain or burning when you urinate). Call your doctor for instructions. Humira is injected under the skin. You may be shown how to use injections at home. Do not self inject this medicine if you do not fully understand how to use the injection and properly dispose of used needles and syringes. Do not inject Humira into skin that is bruised, red, tender, or hard. Each prefilled syringe is for one use only. Throw away after one use, even if there is still medicine left in it after injecting your dose. Do not use a prefilled syringe if it looks cloudy or has particles in it. Call your pharmacist for new medicine. Adalimumab can lower blood cells that help your body fight infections and help your blood to clot. This can make it easier for you to bleed from an injury or get sick from being around others who are ill. Your blood may need to be tested often. Serious and sometimes fatal infections may occur during treatment with Humira. Contact your doctor right away if you have signs of infection such as: fever, chills, sore throat, or flu symptoms. If you need surgery, tell the surgeon ahead of time that you are using Humira. If you have ever had hepatitis B, Humira can cause this condition to come back or get worse. You will need frequent blood tests to check your liver function during treatment and for several months after you stop using this medicine. Do not freeze, and throw away the medicine if it has become frozen. Moderate to severe Crohn’s disease (CD) and to achieve and maintain clinical remission in adults who have not responded well to certain other medications. HUMIRA is also used to reduce signs and symptoms and to achieve clinical remission in these adults who have lost response to or are unable to tolerate infliximab. Moderate to severe Crohn’s disease (CD) and to achieve and maintain clinical remission in children 6 years of age and older when certain other treatments have not worked well enough. As Humira is an immunosuppressant, it will leave the body more prone to infections. The use of TNF blockers has also been linked to cancer, including some rare and unusual types of cancer. Serious infections can occur due to the immunosuppressant qualities of Humira. These include tuberculosis (TB) and other infections caused by viruses, fungi, or bacteria. Some people may have an allergic reaction. Symptoms include chest tightness, wheezing, and other breathing difficulties, hives, itching, and skin rash, swelling of the tongue, lips, face and other parts of the body. Nervous system problems may occur, leading to weakness in the arms and legs, numbness, tingling, visual disturbances and dizziness. Blood problems may occur. A low platelet count can lead to an increased likelihood of bleeding, and a low level of white blood cells make it harder to fight infection. The patient may have a fever that does not go away, or finds they are bruising or bleeding easily. Immune reactions may occur. One example is a lupus-like syndrome, with chest pain and shortness of breath, joint pain, or a rash on the cheeks or arms that worsens when exposed to the sun. Along with its needed effects, adalimumab (the active ingredient contained in Humira) may cause some unwanted effects. Although not all of these side effects may occur, if they do occur they may need medical attention. Patients treated with Humira are at increased risk for developing serious infections that may lead to hospitalization or death. Most patients who developed these infections were taking concomitant immunosuppressants such as methotrexate or corticosteroids. Discontinue Humira if a patient develops a serious infection or sepsis. Patients should not take Humira if they are allergic to any medication containing adalimumab or Mannitol, sodium citrate, monobasic sodium phosphate dehydrate, sodium chloride, citric acid monohydrate, or polysorbate 80. It is important to disclose any current medications and medical conditions before using Humira. Humira should not be used by anyone with a severe infection, active TB, and other infections that may occur when the immune system is weakened. It should not be taken with a number of drugs, including Kineret (anakinra) and Orencia (abatacept). The doctor also needs to know if the patient is taking any immunosuppressant medications, if they or anyone close to them has, or has had, tuberculosis (TB), and if the person is a carrier of the hepatitis B virus. Other products that work in a similar way, known as biosimilars, are also available. In September 2016, Amjevita gained the approval of the United States Food and Drug Administration (FDA). Amjevita can also be used in cases of moderately to severely active polyarticular juvenile idiopathic arthritis from the age of 4 years.